For the past two years, I have had the privilege to further my study of boutis (it's techniques as well as it's historical significance) from Madame Francine Born , www.boutis.fr, who herself has learned from and worked together with Madame Andree Gaussen, http://boutis.chez-alice.fr/ , author of the book "le Manuel de Boutis" and who is considered to be one of the sage authorities on boutis. Mme. Born has been handed the torch from Mme. Gaussen to educate and perpetuate the craft, which Mme. Born does with much dedication and competance. Mme. Born is holding up a tapestry cushion cover, luxuriously stitched and rich in colours. Although this is not boutis, she does appreciate and promote other handwork. Mme. Born presides over two local "boutis" groups that meet monthly. This past spring she invited me to join the group that meets in a town near where we live. 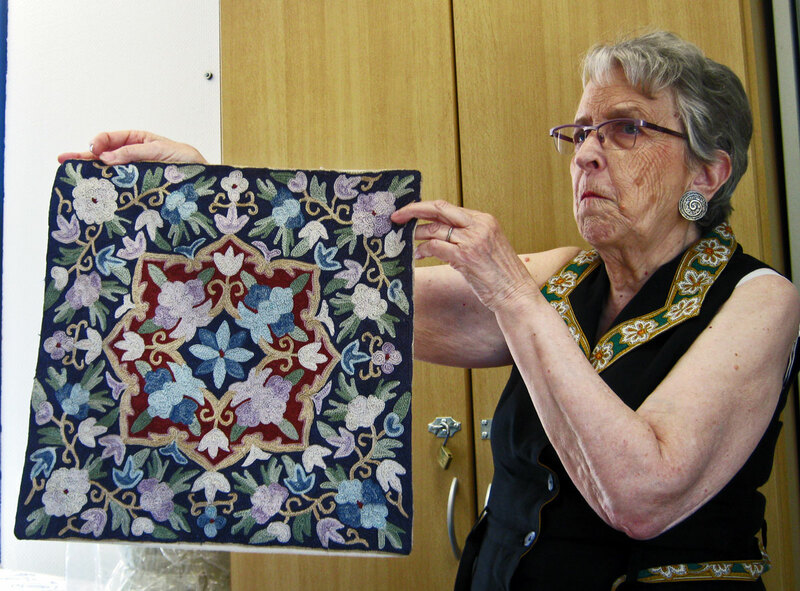 Just as is the case with quilting groups in North America, these "ladies of the club" all come prepared to spend the day working on their current projects, are eager to learn from each other, and enthusiastically and generously share their specific talents and knowledge with others. And of course, Mme. Born is there to offer her expertise and experience and to provide inspiration. 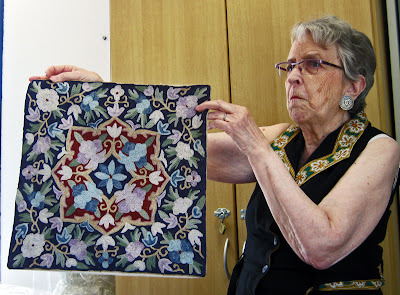 As is consistent with quilters from all over the world, the enthusiasm of today's generation of "boutiseusses" to share their knowledge and the history of boutis is done with generosity and patience, even to "etrangers" (foreigners) such as myself. "Boutisful" ladies all working on their various projects! A beautifully designed and expertly stitched christening gown, made by Nelly (3rd from the right in the photo above). 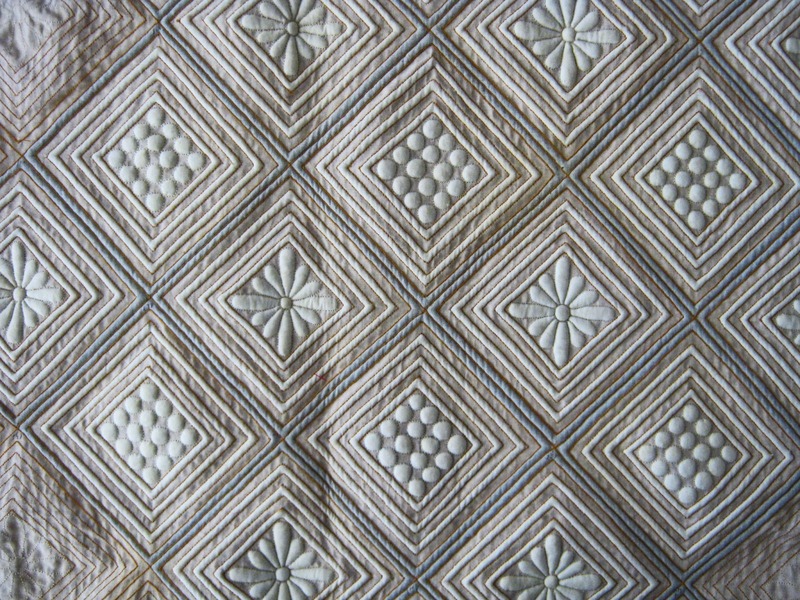 Although traditionally most boutis is stitched using a fine quality white cotton batiste, some of the ladies prefer to use silk dupioni from time to time, particularly when a more contemporary design is used. 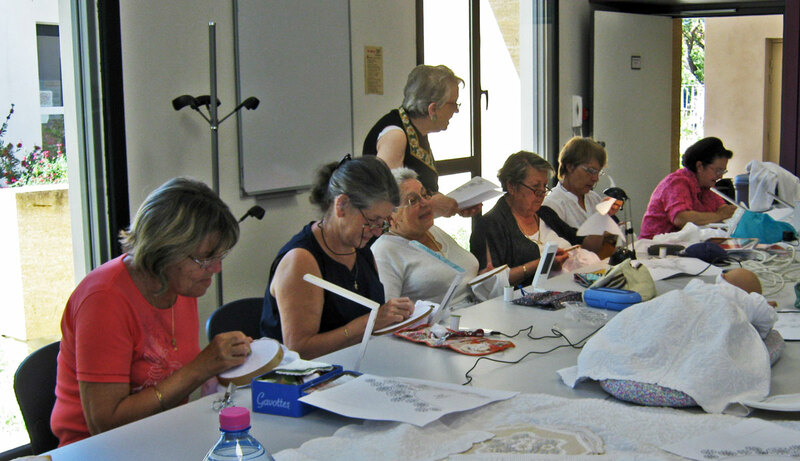 Patricia, current president of this association (standing second from the right), had completed the stitching and the cording of this piece, which is to become a bag, and was in the process of sewing it together. 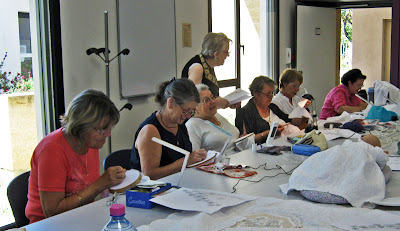 More "boutisful" ladies intensely focussed on their stitching. Mme. Born, standing, is always available to offer guidance and advice. 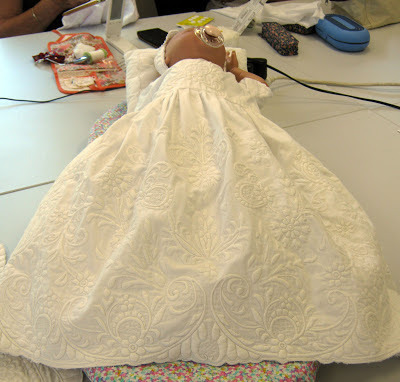 This particular traditional design, adapted by Mme. Born, has been stitched by a number of the ladies. 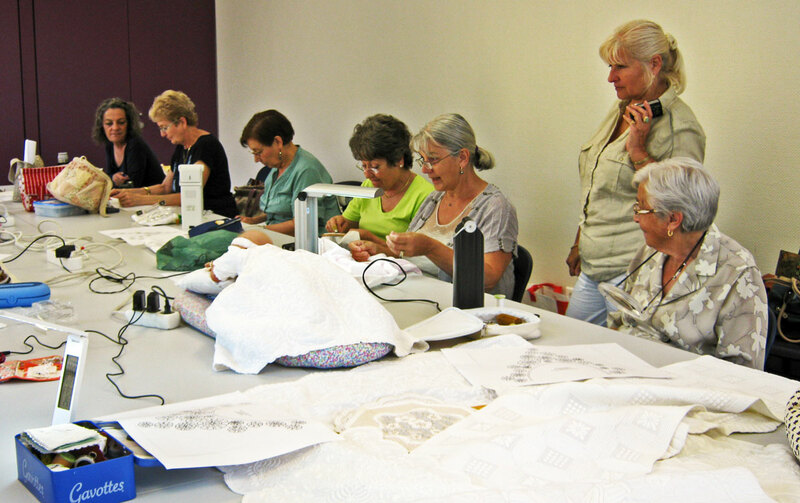 Helene, (third from the left wearing a white sweater), is working on this one. She is using the white cotton batiste on the top, a yellow batiste on the bottom and cording with both white and grey yarn . Another individuated (personalized) design of Mme. 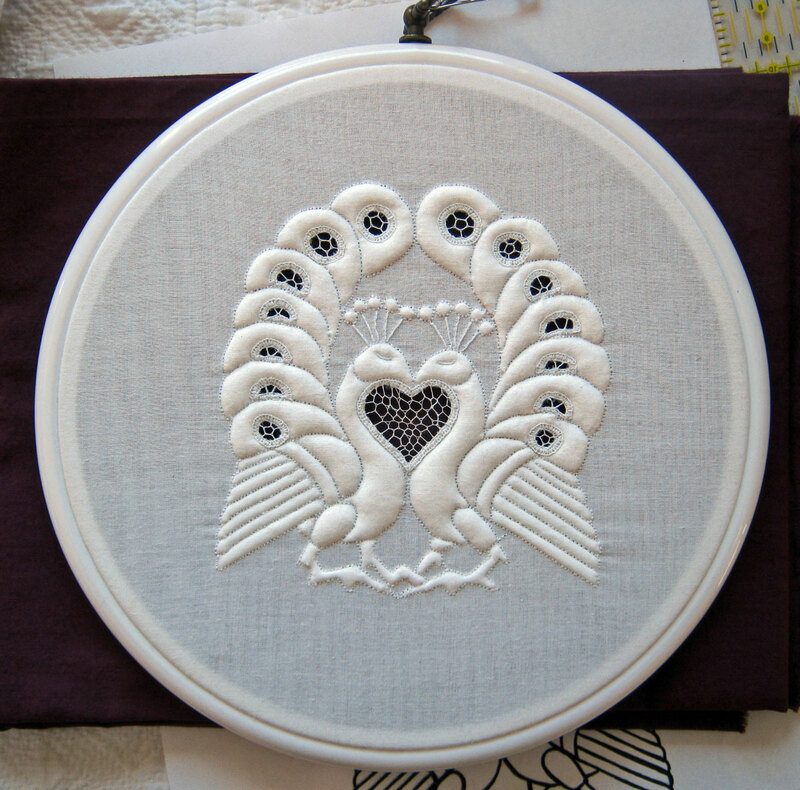 Born's, stitched by Helene. Helene is an expert on some of the less commonly used lace stitches, like the ones used in the insets above. Madame Leone Combes, standing on the left, is a friend and assistant to Mme. Born (standing, right) and accompanies her to many events. She has made many of the boutis pieces that Mme. Born uses as class examples. I feel very privileged to be learning from these very talented women. This class example is made from yellow batiste. Although not as widely used, yellow is another traditional colour used for boutis. 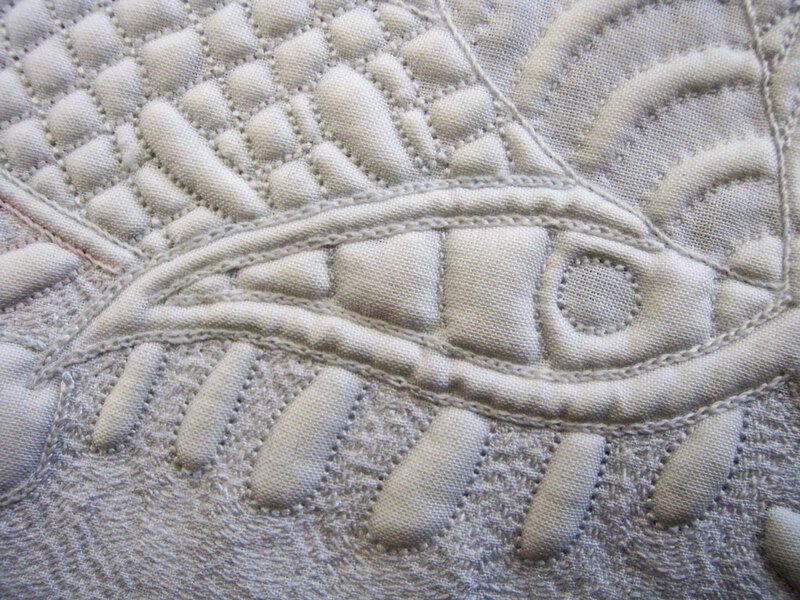 A close-up of one of the pieces showing a sampling of the variety of stitches that can be used. 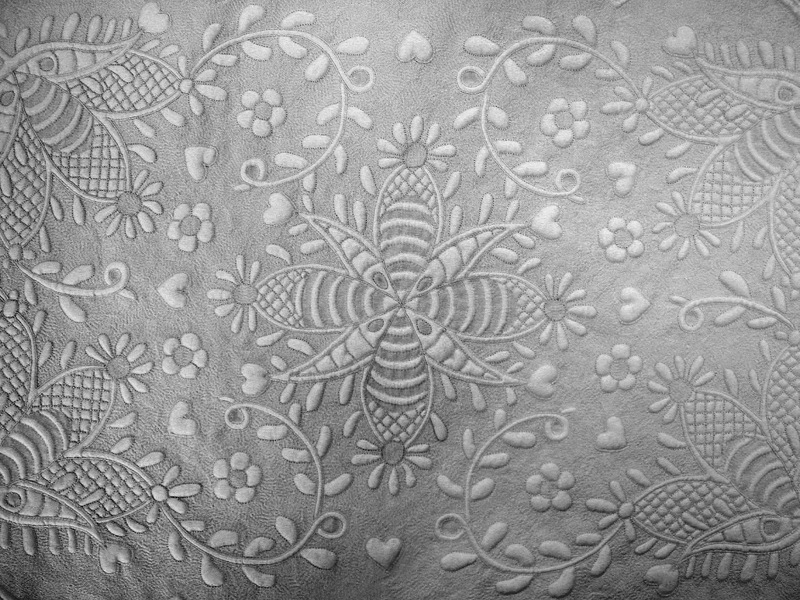 Boutis, sometimes referred to as "broderie de Marseilles" (which translates as the embroidery from Marseilles), bases it's construction on embroidery stitches. 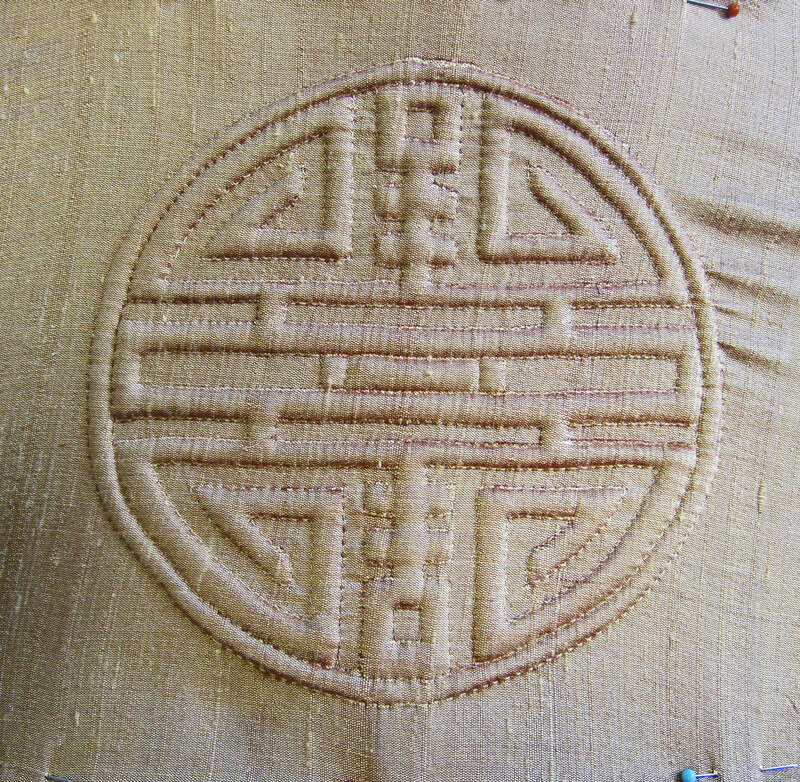 The stitches make the channels through which the cording will pass, which then creates the relief that distinguishes boutis from other needle work. You will recognize the different stitches as those we are familiar with from embroidery, such as back stitch, stem stitch, chain stitch, and the running stitch. The ladies also generously gave their consent to have their work photographed and posted to this blog. 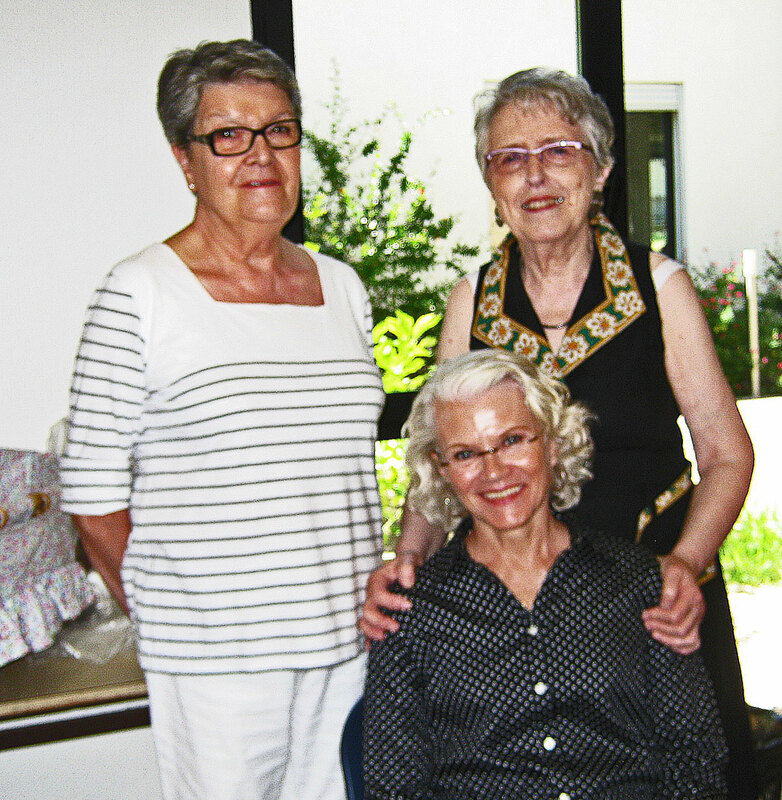 Merci beaucoup mesdames! Wow! What an honor to be invited to join this group of talented women. I love that these women are so generous with their time and talents and I hope you are able to show more of their beautiful work in the future. These ladies focus a great deal of effort on technical perfection, and their stitches are tiny and consistent. It requires a lot of patience and seriously good eyesight, (and a very good loupe). I feel quite humbled by the talent in the room. How interesting to see all the different stitches used! I had been thinking boutis was mainly done with running stitches. How are the squares in the last photo padded? It doesn't look like cord. I have just been thinking of that same yellow colour for a future project of mine. It is based on a Norwegian design, but I am sure the original influence is French. I wonder how long the French have been decorating with that colour? Hi Monica. Until a few years ago, I also thought that boutis used mostly the running stitch and the back stitch. 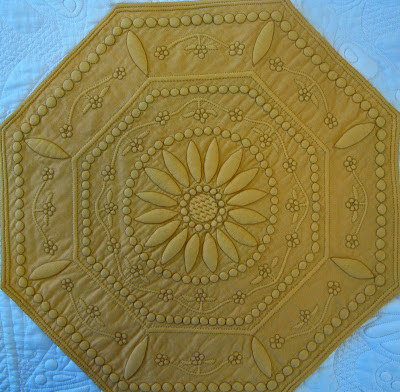 Although they are the basic stitches of most boutis pieces that I have seen, there is a large variety of embroidery stitches used as well, both in antique quilts and contemporary quilts. 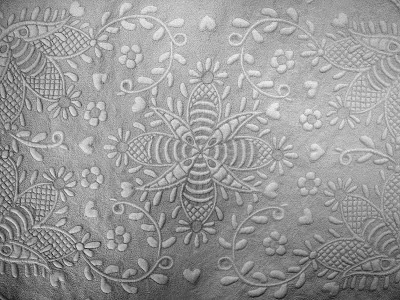 In fact, one of the terms used for boutis is "Broderie de Marseille", which translates as the embroidery from Marseille. It sort of all starts to make sense. All of the boutis pieces above use only cording to add relief. Those little squares in the last photo have all been individually corded, quite likely with more then one run through of the yarn. It's one of those great TV watching activities. 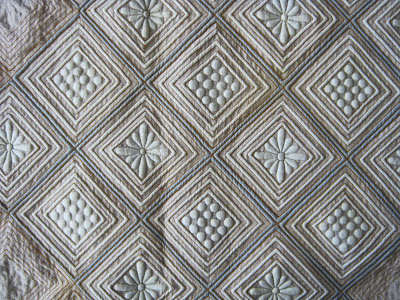 Although white is the colour seen most often in antique boutis, this shade of yellow, as well as other bright colours such as purple and blue, were sometimes used for boutis in the 17th century when the vibrant prints called "Cotton Indiennes" started to be imported from India through Marseilles. I would love to see your Norwegian design. Is it whole cloth?